Sid Meier’s Pirates!, the classic video game first released way back in 1987, has finally docked into the iPhone. This isn’t its first arrival on the iOS platform, though, as it has been previously ported and launched on the iPad in July last year. Apparently, Sid Meier’s Pirates! for iPhone offers nothing new in the way of gameplay enhancements and other bonuses. It appears to be a direct iPhone port of the iPad redesign, which, in turn, was based on the Wii version of Sid Meier’s Pirates! This is evidenced by the fact that the release notes for the new iPhone version and the old iPad version are pretty much identical. As in Sid Meier’s Pirates! for iPad, you get to take on the role of an intrepid Pirate Captain in Sid Meier’s Pirates! for iPhone, as you control 27 ships and customize them with various types of ammunition. 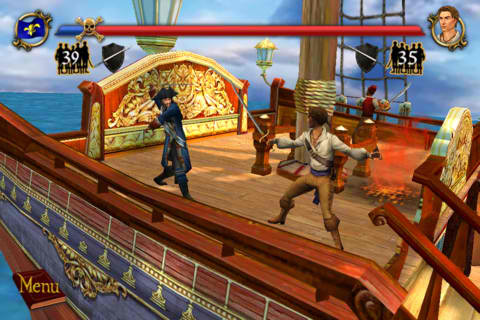 Using the iPhone’s touch controls, you’re tasked to conquer your marauding opponents, including Blackbeard, Captain Kidd, and Henry Morgan. Sid Meier’s Pirates! for iPhone is now available in the App Store for $2.99, two dollars less than its iPad counterpart’s price. Note that this is another example of a developer choosing to release a separate version instead of making its existing iOS game universal. Also, there seems to be no iCloud integration for progress syncing between the two versions.